Parts Department: Qualifier of the Year in the Small Dealer Category Willie Spangenberg of Williams Hunt Humansdorp with Llewellen van Antwerpen, General Manager Parts and Accessories. 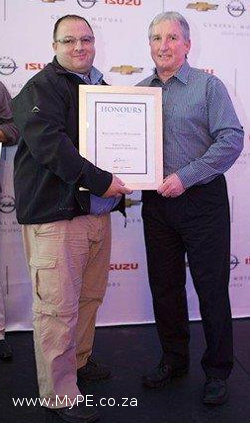 Williams Hunt Humansdorp recently qualified as one of the top performers in the parts department in the Small Dealer Category at the General Motors South Africa (GMSA) Departmental Dealer Honours Awards. The aim of the awards is to recognise dealers who continuously raise the level of customer service and not only meet, but exceed the standards expected of a dealership across all five functional departments, that is- sales, services, finance, parts wholesale and retail and used vehicle sales. Willie Spangenberg, dealer principal of Williams Hunt Humansdorp said they continuously strive to provide their customers with the best service. “We might be a small player in the bigger scheme of things, but our customers remain the most important factor to us,” said Spangenberg. Brian Olson, Vice President, Vehicle Sales, Service and Marketing, said all departments are measured against set targets and have to pass a series of mandatory tests in order to be recognised as an honours qualifier. “Putting the customers of Chevrolet, Opel and Isuzu at the centre of everything we do is one of our key business priorities. We therefore honour and recognise those dealer staff who demonstrate a customer-centric culture throughout the customer’s purchasing and after sales experience,” said Olson. He added that GMSA is reinforcing its commitment to continuously improve its dealer network in South Africa. All GMSA service centres are equipped with a complete range of tools and analytical systems to carry out maintenance and repairs.